Sheila Morin (Ellman), loving wife, mother and grammy, passed away peacefully Monday evening, Jan. 21, 2019, following a courageous battle with cancer, surrounded by her family. She was born on June 24, 1956, the oldest daughter of Sarah Ellman (Drollinger) and Raymond Ellman. Sheila married Doug in 1973 and together they loved and raised two children, Erin and Beau. Sheila spent her life caring for others. If ever there was an emergency, Sheila was the first to be at the side of the family member or friend to offer selfless love and support. 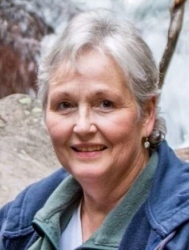 She worked for over 30 years as a certified nursing assistant and certified medical assistant; countless individuals have been touched by her gentle caring hand and spirits bolstered by her loving smile and infectious laugh. Sheila loved the mountains and ocean. Her favorite times were spent with her family traveling, hiking, swimming and photography with Erin. An outing with her was full of fun and food, lots of food! Every special day was acknowledged with a card, lovingly chosen. She would always include a personalized note. Her cards and her words in them are cherished. She loved the holidays — dressing up for Halloween, Easter baskets for all the kids, stockings at Christmas and holiday dinners with all the fix’ns. She and Doug took special care to ensure no one was left hungry … for days. Her final Christmas was spent at Kalispell Regional Medical Center. We wheeled from her room and opened gifts in the foyer. Sheila loved giving gifts. Even in death, her giving continued with the donation of her corneas, granting sight to two individuals she, herself, will never see. Sheila was preceded in death by her mother, father, sister Cindy Martinez, and brother Richard Ellman. She is survived by her husband Doug, and their children, daughter Erin Braaten, her husband Markus, and their children Sawyer, Victoria, Madeline, Garrett, Hayden, Teigen, Zayne and Emmalynn; and son, Beau Morin, with his boys Luke and Orion, Beau’s girlfriend Rena and daughter Ada. Sheila is also survived by her sister Jane with her husband Jim Leatherberry; and brothers, Dan and his wife Kate Ellman, Tim Ellman and Paul Ellman; and multiple cousins, nieces, nephews and innumerable friends. Services will be held at 1 p.m. Saturday, Jan. 26, at Grace Church.